Maryland: Both parties acknowledge that this contest between Democratic Lt. Gov. Anthony Brown and GOP businessman Larry Hogan has gotten very close in this very blue state. Neither side thought they would be spending seven figures here, particularly this late in the race. Democrats believe that they caught Hogan’s surge, and have had enough time to define their own candidate. We tend to agree and believe that Brown enjoys a slight advantage, but polling and the barrage of television ads from both sides suggest that this belongs in Toss Up. The Cook Political Report is an extremely highly regarded source of political analysis. His team has had their ear to the ground for decades and is scrupulously nonpartisan. I’m also pleased that Charlie Cook and his family have been longtime residents of the Town of Chevy Chase here in Montgomery County. 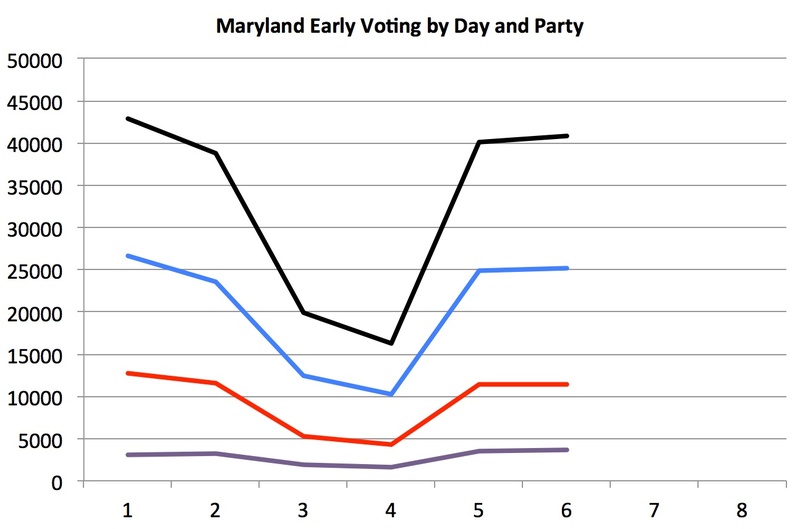 Turnout was way, way up on the final day of early voting with 64,247 Marylanders going to the polls. So far, 8.59% of all registered voters have cast ballots. Indeed, Democrats have now finally posted a gain in the number of voters from 2010. The total number of registered Democrats who have voted is up 48,809 as compared to 28,509 for Republicans and 10,008 for the unaffiliated. That gives the Democrats an increase in their raw vote advantage over the Republicans of 20,300 votes banked from 2010. The increased advantage held by Democrats over Republicans and unaffiliated is 10,291–a nice reversal from the close on Day 7 for Team Blue. However, the Republicans have done a better job of increasing their vote from 2010. The number of Democrats who voted early is up 34.8% in 2014 compared to 48.7% for Republicans and 54.6% for unaffiliated voters. 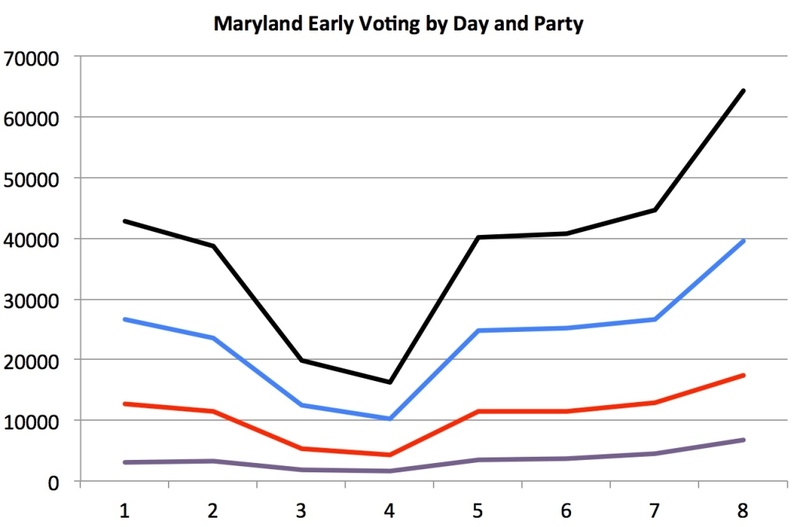 In short, Democrats have benefited from the expansion of early voting because more people voted and there are far more Democrats than Republicans in Maryland. But they gained less than they should have because the Republicans did a better job of turning out early voters than in 2010 and narrowed the gap with Democrats despite their strong Day 8 finish. The following table shows the final tallies in each county. 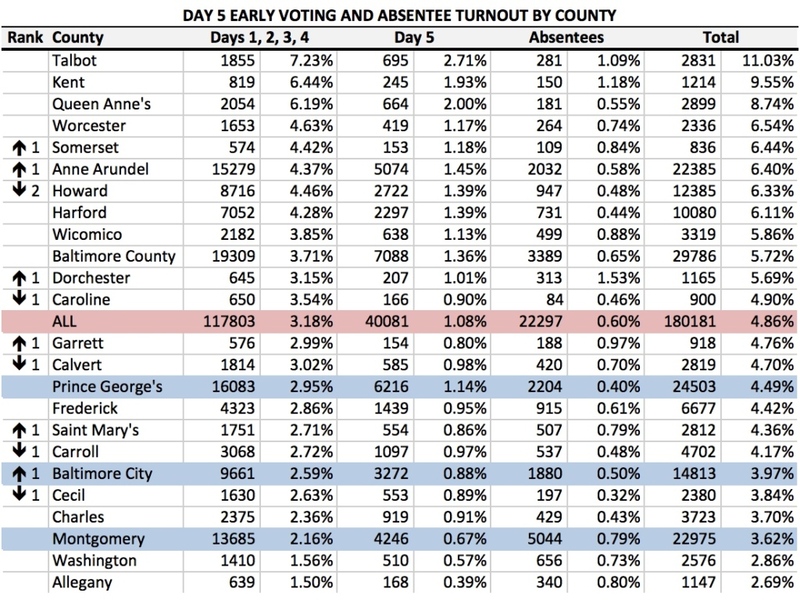 Clearly, counties in the Baltimore suburbs and Eastern Shore did a better job of turning out voters than those in the Washington region, Baltimore City, or Western Maryland. The county numbers correlate well with those from 2010 as @mdtruth has explained. In terms of county turnout on the final day, Prince George’s performed above the state average with 1.24% of Prince Georgians casting an early ballot, helping it finish not too far below the state average. Baltimore City and Montgomery continued to under perform with just 0.97% of Charm City voters and 0.80% of MoCO voters going to the polls. And thus ends my first blog post ever from an airplane! I’ll try to provide more analysis later. Early voting is over but as of 11:30 on Thursday night, the Maryland State Board of Elections has not posted the final numbers on early voting participation. Nevertheless, here are some thoughts as the opening act of this year’s elections come to a close. 1. The Impact of Early Voting is Overrated. 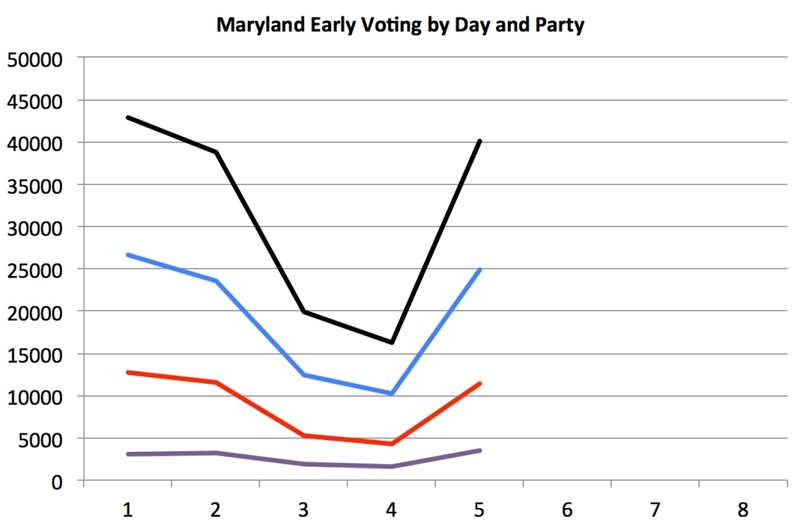 Most studies of early voting indicate little effect on total turnout. Unsurprisingly, many early voters are people who would have otherwise participated on Election Day or voted absentee. The latter explains the decline in absentee ballots. EV provides opportunities for both parties but mostly convenience for voters. 2. Many lament that Election Day is not a holiday or we don’t vote on the weekend. Except that early voting dived by roughly 50% on a gorgeous weekend over early voting held on weekdays. Confirmation for political science studies that show zero relationship between free time and propensity to vote. 3. The Case for Republicans: Early voting was supposed to benefit Democrats and it was a bust. Despite an expansion in the days for early voting and number of early voting centers, Republicans have prevented Democrats from any net gains over 2010. And this occurred even though early voting increased and there are far more Democrats than Republicans in Maryland. Republicans increased their rate of turnout to match that of Democrats. 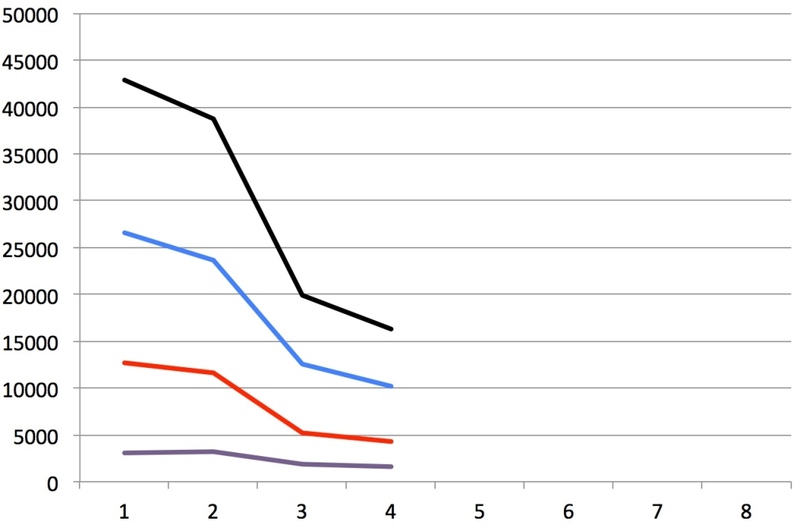 Democratic turnout in the big three was terrible. 4. The Case for Democrats: Once the final numbers are released, the final totals will reveal a gain in raw votes for Democrats. Precisely because there are more Democrats, the addition of another 40,000 or so voters will result in the Democrats going into Election Day with a net gain from early voting. As @mdtruth has reported, 2010 turnout predicts 2014 turnout very well, so the lack of a net change is not a big surprise. 5. My Assessment: To the extent that it does matter, the evidence that either party has gained substantially over 2010 is thin. As of the end of Day 7, Republicans had a net gain of less than 2000 ballots over 2010. The number is around 5000 if unaffiliated voters are also included. But the numbers are still down for everyone if you factor in the decline in absentee voting, which is of course not yet complete. 6. But If I Must Pick a Winner: Republicans have more reason to feel pleased. Democrats had hoped that early voting would result in a substantial gain in votes banked in advance of Election Day. That hasn’t happened. And it’s hard to blame it on being a hard year for Democrats, as 2010 was worse. 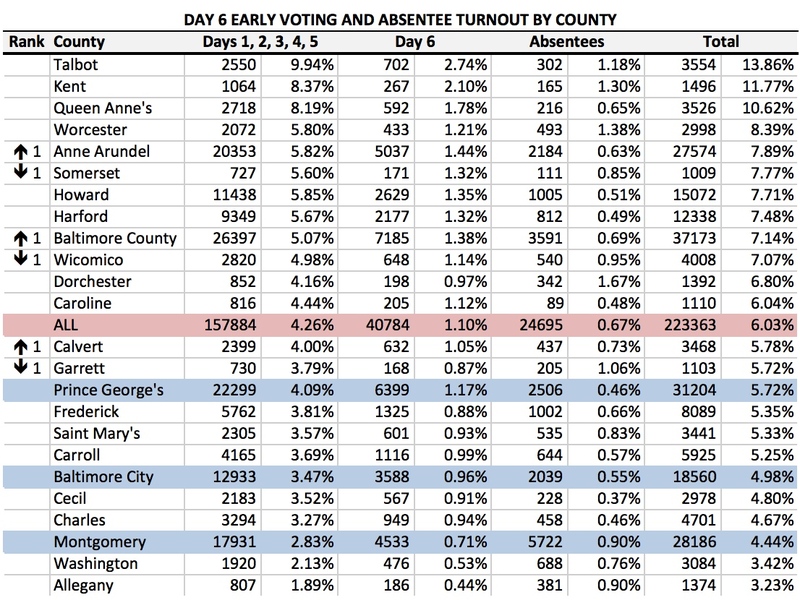 Nonetheless, @mdtruth has it right in that 2014 turnout correlates well with 2010 turnout. Any real impact on the final outcome is unclear and likely small. Early voting hit a new high of 44,718 on Wednesday, easily beating the previous high on the first day of early voting. Moreover, the total number of early voters, 243,386, now exceeds the 219,601 who participated in early voting in 2010. Contrary to my expectations expressed yesterday, however, the increase in the number of early voters has not yet benefited Democrats. While the number of Democratic early voters has increased by 9,344, the number of Republican early voters is up by 11,110 and unaffiliated voters by 3,301. Unlike in 2010, when the overall Democratic turnout rate surpassed that of Republicans by 0.85%, Republicans are only 0.02% behind Democrats–a gain for Republicans over yesterday. As of Wednesday night, 7.35% of Democrats had voted compared to 7.33% of Republicans and 3.28% of unaffiliated voters. Right now, 0.19% fewer unaffiliated voters have cast votes than in 2010–a bright spot for Brown as they are expected to break for Hogan in this election. However, the number of unaffiliated early voters is up because the number of registered unaffiliated voters has risen since 2010. As each day’s increase is a smaller percentage of the total, the changes in county rankings unsurprisingly have tended to decrease. In good news for Democrats, Howard and Prince George’s have both jumped one place from yesterday. Montgomery remains dead in the water in 21st place. In Talbot, an incredible 16.27% have voted. One caution: while the early vote is now up over 2010, the number of absentee votes received remains much lower. While 27,569 absentee ballots have been returned thus far, a total of 87,813 absentee ballots were cast in 2010. So the total of early plus absentee ballots cast in 2014 does not yet exceed the total of the same from 2010. Unless early voting jumps quite a bit tomorrow, that will remain true at the conclusion of early voting. Early Vote is Very Stable. Democrats will Start Gaining from EV Tomorrow. Western Montgomery Epicenter of Low Turnout. 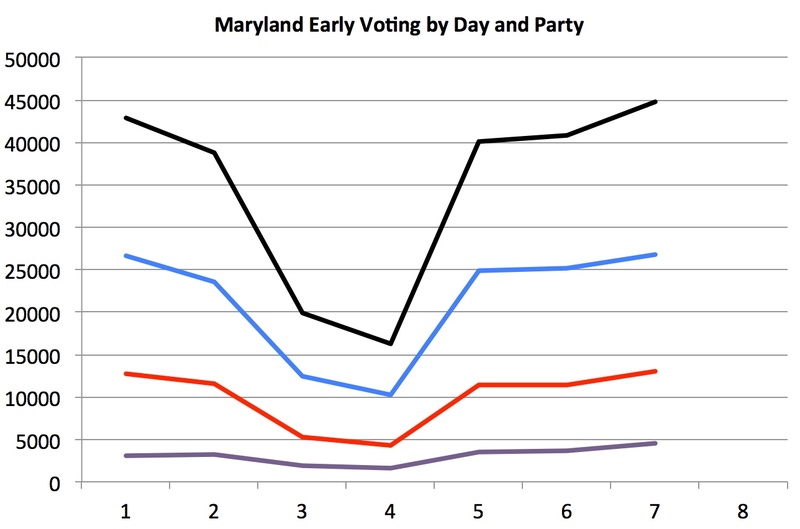 Early voting remained highly stable on Day 6, rising just a bit over Day 5. The rate of Democratic turnout continues the trend of rising at a miniscule rate above Republican turnout. Right now, 6.04% (122,996) of registered Democrats have voted as compared to 5.97% (56,675) of Republicans and 2.59% (17,030) of the unaffiliated have cast ballots. The number of registered voters who have voted early in 2014 equals 90.5% of the 2010 total across all days. The total number of Democrats who voted early in 2014 is 87.6% of 2010. The similar figures are 96.8% for Republicans and 93.0% for the unaffiliated. The higher GOP number reflects that they have virtually closed the gap in turnout with Democrats from 2010. Total early voting turnout should exceed that of 2010 tomorrow. At that point Democrats will start to benefit from the ramp up in early voting despite the lost of their advantage in the rate of turnout. Due to their dominance, Democrats will extend their raw vote advantage over the Republicans. The gap in turnout between high and low turnout counties continues to grow with the big three Democratic counties all lagging more and more behind the high turnout counties. Except for Howard, I expect every county above the state average in turnout to vote for Hogan. Charles, the only other solid Brown county, is also below the red line. 2.05% in District 39 (Clarksburg-Germantown-Mont. Village). Lt. Gov. Brown seems tailor made to appeal to the liberal voters who predominate in this part of the world. Yet, these levels are between 34% and 42% of the statewide rate. The mystery is even greater because education is usually heavily related to turnout and these districts have among the highest share of college graduates and people with graduate degrees in the country. 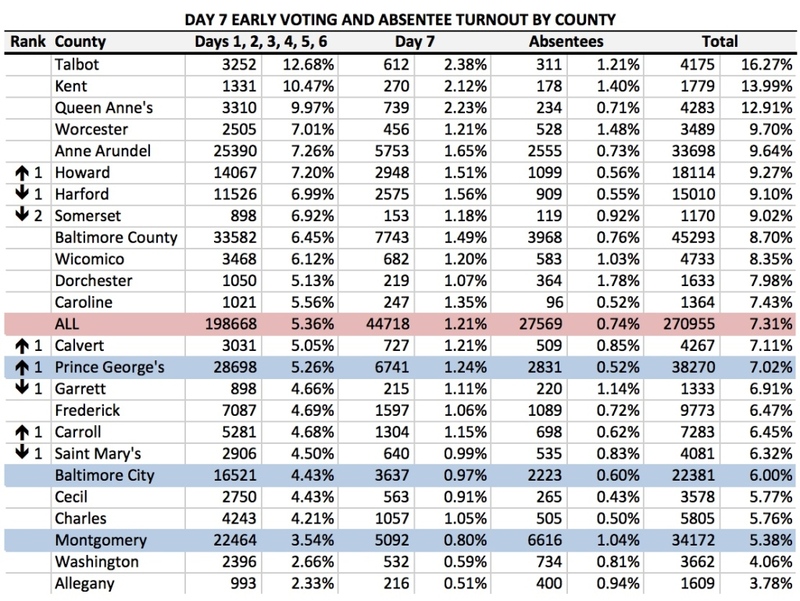 Why is MoCo Turnout so Abysmal? Reminders to vote are few. I have received no calls–robocalls or person-to-person calls from either Democratic Party or the Brown campaign. Nor have I received any GOTV mail. Maybe it’s because I am a regular voter so they know that I’ll vote. I did receive one candidate mailer from Chris Van Hollen and I think another from Ike Leggett. Nothing compared to the pre-primary deluge. On television, there are as many ads for Virginia Senate candidates as for the Maryland’s gubernatorial race. We also could see more of Anthony Brown in person. It’s odd that it just doesn’t feel like the state’s largest jurisdiction has gotten much face time with the candidate. 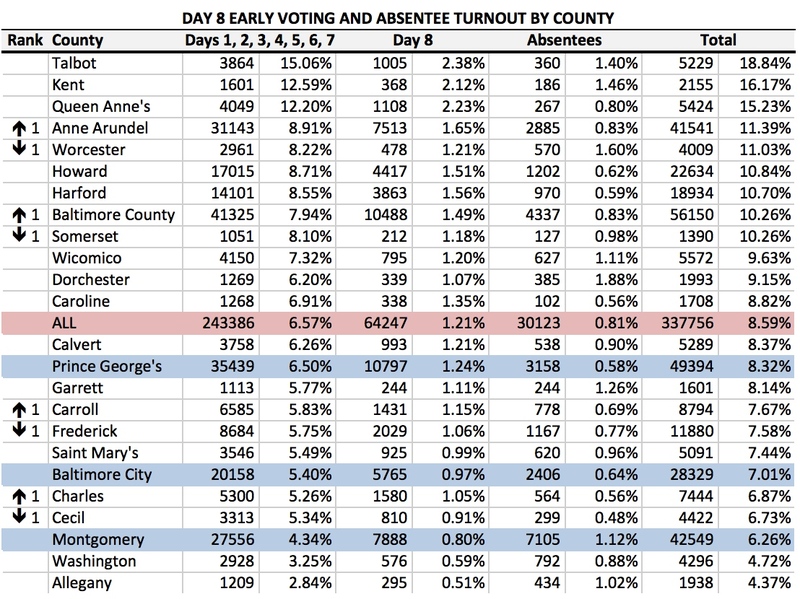 Turnout in Montgomery has been especially weak so events in Potomac or Bethesda as well as Rockville and Gaithersburg would not go amiss. Democrats are scrambling to get volunteers for early voting centers. The county training for precinct officials was less well-attended than in previous cycles. If Democrats are providing rides to the polls as in past years, I haven’t heard about it. Republicans have been weak for some time in Montgomery, and that hasn’t changed. Brown was smart and opened another campaign office in Bethesda but that doesn’t seem to have picked up the slack. Virtually all of the Democratic candidates for elective office in Montgomery sit in safe seats, so voters have little reason to go to the polls and candidates have little incentive to mobilize them. Completely the opposite of the Democratic Primary. It also helps explain the gradual atrophy of the Democratic organization–muscles get flabby when they aren’t exercised. Voters are profoundly uninterested in the election to the point that one would barely know that we are at the end of a campaign. Honestly, it just doesn’t feel like an election around here. There are almost no signs up outside people’s houses in my neck of the woods. Take pride in it; don’t hide from it. In extremely tough economic times, Maryland balanced its budget and maintained its AAA bond rating while protecting public schools and universities–critical to both kids but and the State economy. Leadership played a key role in making Maryland the first state to vote for marriage equality. In contrast, Hogan has done a good job of creating resentment at what people haven’t liked. For whatever reason, Democratic messaging is not connecting in Montgomery. Democrats have given voters many reasons not to vote for Larry Hogan but the reasons to vote for Anthony Brown remain fuzzy or simply don’t excite. The ads on choice feel like the 1990s are calling and wants their commercials back, likely because Parris Glendening ran similar ones against Ellen Sauerbrey. If the Purple Line motivates voters beyond core supporters and opponents, it is well hidden. Perhaps closing strongly with Brown’s positive pre-K and school construction program might give people a concrete reason to go out and vote for Anthony Brown. The Washington Post has the story. The poll was commissioned by the Maryland Republican Party.